Where will your wheels take you this summer? 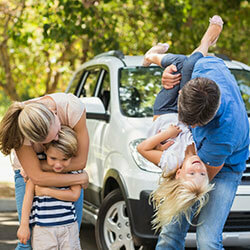 With school out for the summer, it's time to plan your family road trip! Wherever you go in Canada, there are many great places to stop and things to do while on the road. We've picked a few great places of interest in our Great Canadian Road Trip Stops and Tips infographic (see below). But let's face it, Canada is a vast land, and there's no way to capture the hundreds of other beautiful stops across the country. Take your car in for a maintenance check before leaving. Clean your car, inside and out (don't forget the trunk). Plan ahead: Make a schedule and decide on a route, but be flexible and stay calm if things don't go as planned. Don't drive for more than eight hours a day. Bring a spare car key, just in case. Let the driver drive and the navigator navigate. And, don't worry if you missed an exit. There's always another one ahead. Pack a real, honest-to-goodness road map. Carry your proof of car insurance, driver's licence and vehicle registration. Don't drive distracted; leave the phone in your glove compartment, or better yet, in the trunk. Instead of eating while driving, pull into a town for a sit-down meal. This doubles as a nice rest stop too. Research ahead of your trip or ask a local for recommendations on where to eat or stay for the night-a good inn, hotel, bed and breakfast, resort... whatever suits you style and budget. Get travel insurance. Whether you're a Canadian travelling outside of your home province, or a visitor to Canada, travel insurance can help when the unexpected happens. Take lots of pictures. But avoid posting them on your social accounts until you've returned home. That way, you don't tip off burglars that your home is empty. Road Trip Infographic: Where Will Your Wheels Take You?